As Tupac once said, “Reality is wrong. Dreams are for real.” By that logic, Los Angeles will be hosting its first World’s Fair in 2022—or so a group of business owners, county officials, and various executives hope. A campaign popped up on Indiegogo last week seeking a preliminary $100,000 for the Los Angeles World’s Fair (LAWF), which basically sounds like Logan’s Run meets Disneyland. The campaign invites contributors to “picture the Los Angeles of the future” and is billboarding a variety of potential attractions, including Hyperloops, “3D printed gourmet delicacies,” and self-driving vehicles. The fair would be installed in 2022 and run through 2024. The sum from this initial crowdfunding push would go towards building the Expo’s first of many transit-accessible pavilions, which “are going to be multipurpose and will be something for the fair, but then, hopefully, transformed into something for the community,” backer Loren Sokolow told the Los Angeles Business Journal. (Here is the LAWF’s first well-intentioned castle in the air. If the Olympics are any indicator, it’s likely these event-specific pavilions will cost a whole lot of money only to fall into ruin.) 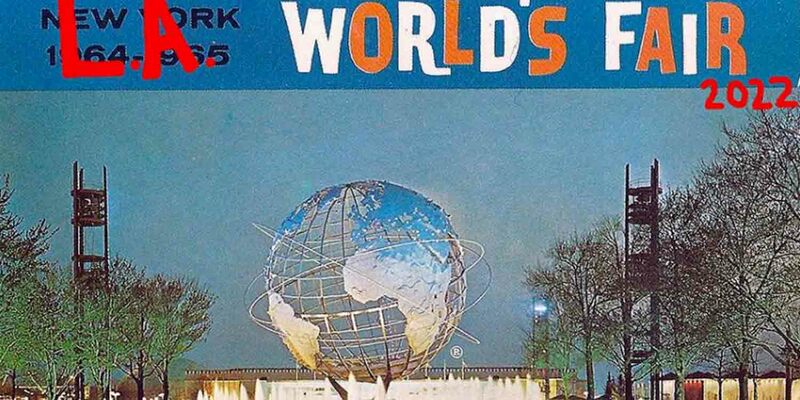 Another hitch in the plan: as our friends over at Curbed LA so aptly pointed out, a country can only host a legitimate World’s Fair if it is part of the Bureau International des Expositions (BIE). The United States is not. Even so, Barry Howard, who advises the LAWF committee, is under the impression that the U.S. will rejoin (for an undisclosed membership fee) as plans for the fair are fleshed out. Despite its hurdles, a World’s Fair in L.A. could be pretty awesome. The last time the United States hosted a sanctioned Expo was in 1984 in New Orleans (the only World’s Fair in history to declare bankruptcy during its six month run). Surely Los Angeles, “home to the largest non-native populations of 26 countries worldwide,” would fare a bit better. The LAWF campaign has already raised over $41,000, with 56 days left to reach its $100,000 goal. If all goes well, we think it’s only appropriate the committee enlists Tupac’s hologram to provide the entertainment.